The Dutch will “pay the price” for the “shameless” treatment of a Turkish minister, President Recep Tayyip Erdogan said in a strongly-worded statement. He urged international organizations to put sanctions on the Netherlands. “If you are willing to sacrifice Turkish-Dutch relations, you will pay for it,” Erdogan said on Sunday, as cited by Hurriyet. “What’s more, we’re not done yet,” the Turkish leader added. Over the past few days, the West has revealed its “true face,” Erdogan continued, referring to the recent deportation of Turkish Family Minister Fatma Betul Sayan Kaya, who was escorted out of the Netherlands by police. 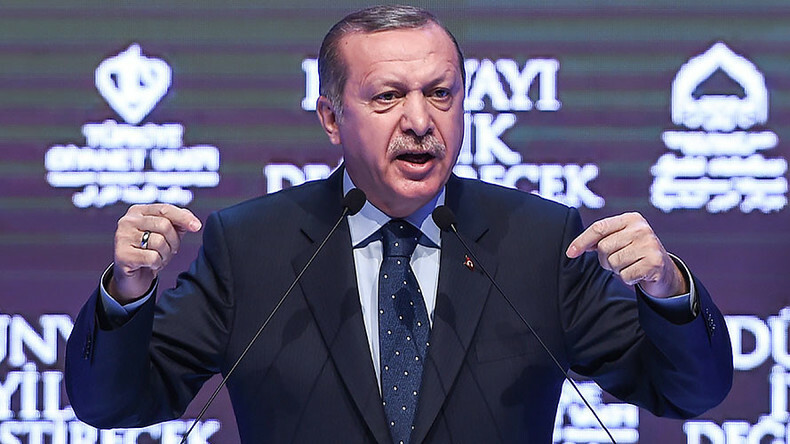 Erdogan reiterated his previous assertion that the Netherlands’ conduct towards the Turkish officials was a sign of “Nazism, fascism,” repeating once again. “I said Nazism is dead. I thought Nazism was over, but I was wrong. It turns out that Nazism is reawakening in the West,” the president asserted. “They will pay the price of treating my citizens, my foreign minister... in an impudent way,” he said. Banning the family minister from entering the Turkish consulate was inconsistent with the freedom of movements, Erdogan said, hinting that he himself may travel to Europe to attend the rallies: "I can go to any country I want if I have a diplomatic passport." BREAKING: Turkey's Erdogan renews 'Nazism and fascism' accusation against Dutch after minister is ousted from Netherlands. BREAKING: Turkey's Erdogan says Netherlands will 'pay the price' for 'shameless' treatment of minister. The Dutch “will learn what diplomacy is,” Erdogan said, adding that their actions “cannot remain unanswered,” according to AFP. “They went as far as to lock the door of the consulate [in Rotterdam],” he stated. Erdogan has also branded the Netherlands a “banana republic” for the way it treated Turkey’s foreign minister. In another comment, the Turkish leader urged unspecified international organizations to “raise their voices” and impose sanctions on the Netherlands, AP reported. The Netherland’s prime minister, Mark Rutte, reacted to Erdogan’s comments by saying that Ankara must apologize for comparing the Dutch to Nazis. Rutte called the Turkish leader’s statements “unacceptable,” adding that they aren’t helping to de-escalate tensions between the two countries. The Netherlands will have to respond if Turkey continues on its current path, he warned. Earlier, Rutte said he is determined to ease the flare-up in tensions, saying “we want to be the more prudent party,” as quoted by Reuters. “If they escalate, we will have to respond, but we will do everything in our power to de-escalate,” he said. In his latest remarks on the conflict, Turkish Foreign Minister Mevlut Cavusoglu said making a formal apology “is not enough,” warning that the Netherlands’ “fascistic” actions will have consequences, according to Hurriyet. Cavusoglu went even further in his accusations when he gave a speech in Metz in France on Sunday afternoon. "The Netherlands, the so-called capital of democracy, and I say this in quotation marks because they are actually the capital of fascism," said the Foreign Minister. Dutch Government's stance reflected in such a deplorable decision is no different than Wilders racist and fascist mind. The French Foreign Ministry said that Paris “calls for a de-escalation” in tension between Turkey, the Netherlands, and other EU members. “It also calls on the Turkish authorities to avoid excesses and provocations,” the ministry said in a statement.